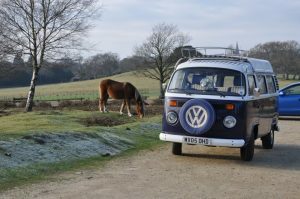 A vw campervan hire holiday in the UK offers fun, relaxation and comfort whether you are travelling with your family, your partner or a group of friends. The UK offers some of the world’s most historic sights and cultural landmarks, as well as stunning scenery and a wealth of activities for the outdoors adventurer. Campervan hire is the best way by miles to take it all in: you can roam from big cities to quiet country villages, from the mountains and valleys of Wales to the green glades of the New Forest, from eating sticks of rock at England’s legendary sandy beaches to tucking into haggis on the streets of Edinburgh. A VW camper is comfortable and flexible: on your journeys around the UK you can switch from taking in the views from your seat to whiling away the time watching television or reading a book, so it’s great for children. You have the luxury of being able to stop when you want and park up your camper for the night when and where you choose, forgetting about the hassle and expense of having to book hotels every night. You don’t have to rely on following a package tour or take time over catching public transport – hiring a camper gives you a moving accommodation base wherever you go, so that you can plan your route as you choose and see the sights at your own pace. A motorhome holiday is also one of the most economical ways to see the UK. The outdoor sights and activities of England, Northern Ireland, Scotland and Wales are second to none, and hiring a campervan in the UK is an unbeatable way to experience them. Whether you are venturing to the coastal paradise of Cornwall in the summer, stopping off at Dorset’s Jurassic Coast on the way, or going in search of the most spectacular views of the Lake District, taking a campervan on holiday with you gives you the perfect opportunity to discover the most exciting parts of the UK. In Scotland, enjoy the ancient sights around Edinburgh before driving up to the purple hued mountains of the Highlands and the craggy western coast. Maybe even take your RV on one of the many island ferries to explore the castles and whiskey distilleries of the Isles of Rum, Jura and Islay. In Wales, experience the magic of the valleys and discover the tales of the Round Table at King Arthur’s Caerleon. By hiring a VW Campervan Hire there’s no limit on what you can and can’t do on your holiday in the UK. You can explore the mystical stone circle of Stonehenge in England, and tread the steps of the Vikings in York, see the dreaming spires of Oxford and find adventure in the leafy Sherwood Forest in Nottinghamshire. It’s also very easy to take your vw camper over on the ferry to Northern Ireland, to see the spectacular Giant’s Causeway and the beautiful Antrim coast. 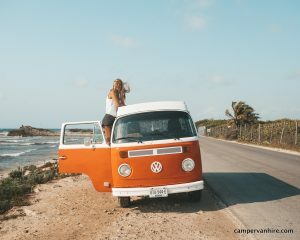 Hire a VW camper van for your holiday in the UK for an unforgettable journey! VW Campervan Hire makes the perfect holiday!